Kromex® is a patented technology by Demak for in house manufacturing of 3D emblems and decals with chrome external finishing. The technology will give a fantastic opportunity to revolutionize your business, by letting your company to enter in new markets or by amazing your existing customers with new outstanding products. Kromex® is used in many different application fields: Automotive, car after market, motorcycle, farm tractors, marine, home appliances, sport emblems, cosmetic market and many other. The continuous R&D of Demak Lab enables us to give certifications and provide our customers with all the tests conducted on Kromex® materials. A Kromex® emblem is fully in compliance with the strictest automotive regulations. Kromex® has very important winning points, for example the rapid and inexpensive tools engineering using graphic software, or the fast and cost effective sampling to supply your customer with new ideas just in one week. 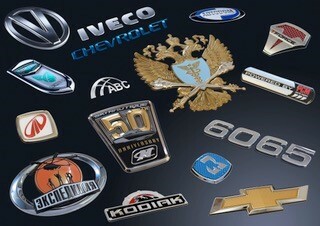 Kromex® emblems and logos are “flexible” and easily applied both on flat or curved surfaces. Moreover, it’s possible to add special effects thanks to satin, matt, colored finishing or even with the use of PU resins on top. Vist our booth 1609 at LabelExpo Americas on 25-27 September 2018 to find out more!